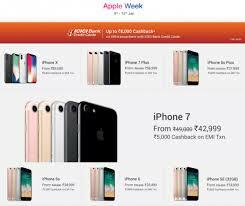 Flipkart has announced Apple Week starting from May 21 to May 27 under which the company has announced loads of offers and discounts on select iPhone models, iPad models, Apple Watch, MacBook, and more Apple products. Flipkart is offering an additional assured buyback value of up to 50 percent on select iPhone models. Also, buyers have the chance to avail up to Rs. 10,000 cashback on purchase of select products with ICICI Bank credit card EMI transactions. offering the iPhone X at prices starting at Rs. 85,999, down from Rs. 89,000. Also, the iPhone 8 and iPhone 8 Plus are available starting at Rs. 62,999, while originally the starting price is Rs. 67,999. There are offers on older iPhone models as well. The Apple iPhone 6s (32GB) is available at Rs. 33,999 (MRP Rs. 40,000), the iPhone 7 (32GB) can be purchased at Rs. 46,999 (MRP Rs. 49,000), and the iPhone SE (32GB) is priced at Rs. 17,999 (MRP Rs. 17,999). iPad 2017 model with Wi-Fi and 32GB storage at Rs. 22,900, while the MRP of the device is Rs. 28,000. Further, a discount can be availed on Apple Watch editions with Series 1 starting at Rs. 22,900, and the latest Series 3 bearing a price tag of Rs. 29,900. The Apple Watch Series 2 is currently listed as 'out-of-stock'. The Apple MacBook Air is available at prices staring at Rs. 55,990 in the Flipkart sale. Finally, AirPods are priced at Rs. 11,499; EarPods can be bought for Rs. 1,899, and Apple TV (32GB) is priced at Rs. 14,698.